Since we first published this article, some new stains have been introduced. We recommend you browse our site with honest reviews for recommendations for the best stain for a new pine deck when it comes to prep and stain application. We always appreciate your input, so feel free to leave a comment below with pictures of your pine deck stain projects. Need Help Finding the Best Stain for New Pine Deck? The best time to stain a deck is after it is built while the wood is still new and has not been compromised by weather damage. However, it is important to allow a new pine deck to dry out for several months before staining it. A new pine deck contains too much moisture at first and you do not want to trap that moisture in the wood by staining it too soon. Wait for the wood to reach 12% moisture level or less. This can be checked with a moisture meter. As mentioned this usually takes a few months of warm weather depending on the sun exposure the deck receives. Do not wait too long though like a year or more because that is when most of the damage occurs to unprotected pine. How To Remove the Ink Stamps from New Decking? Update for 2019: How To Remove the Ink Stamps from New Decking? Those who are familiar with the deck staining process are aware of how important it is to properly prep your deck before staining for beautiful results. In this article, we discuss how to get rid of pesky ink stamps from new decking before prepping and staining your wood surfaces in 2019. We always appreciate your input, so feel free to leave a comment below with pictures of your deck stain projects. Pressure treated decking when new has a tendency to have very annoying ink stamps on the wood when processed at the mill. 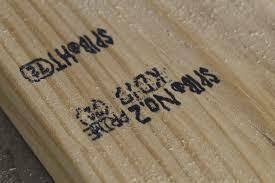 Lumber is stamped at the mill according to its grade. An American Lumber Standard Committee (ALSC) grade mark and an American Wood-Preservers’ Association (AWPA) tag certify the lumber’s quality. These stamps are very troublesome for owners to remove prior to applying a decking stain that is either transparent or semi-transparent as the ink will show through the stain. We appreciate you visiting Deckstainhelp.com as we continue to be your go-to source for the latest in deck restoration news and trending topics through 2019. Below, we talk about the Best Stain for New Pressure Treated Pine. Feel free to leave a comment below with any pictures you may have. Whether you have had an old deck replaced or simply had a new deck added on, there are certainly a lot of benefits. Wood decks increase a home’s curb appeal and value. They add extra outdoor living space and are the witness of many come to family gatherings and get-togethers. A new deck’s strength and sheer durability makes you feel like it will last forever. But as some homeowners soon find out, that newness can wear off and that once beautiful deck becomes a neglected eyesore. But there is hope and to keep your new deck looking new and lasting for many years to come, you merely have to take care of it. Weather and elements like moisture and fading UV rays are a new deck’s biggest enemy. So the goal of keeping a deck looking good is to provide it with some protection.